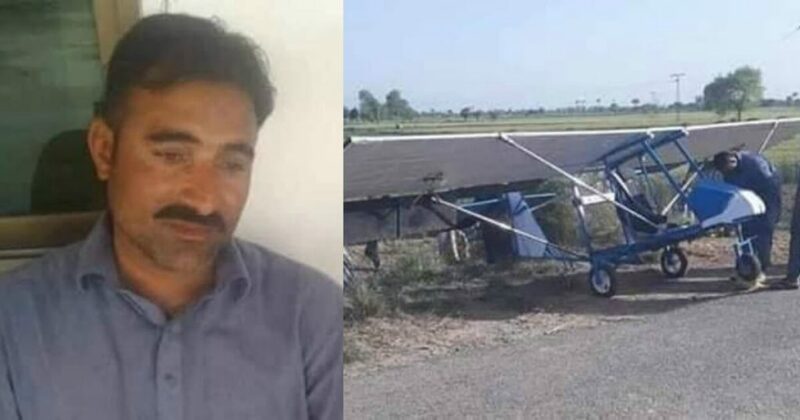 A Young Man Created His Own Airplane In Punjab And Police Took Him Away Before He Could Fly It! Punjab Police took a man in custody for making a small aircraft on Monday. According to the details, a youngster Muhammad Fayyaz in Pakpattan made a small aircraft and brought it to the street to fly but before the aircraft took off, police booked him. 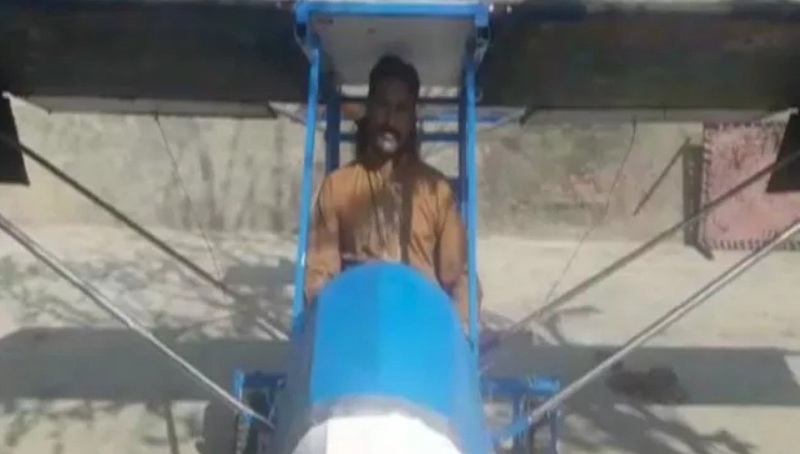 Punjab Police registered an FIR against the student of matric class Muhammad Fayyaz stating that he developed the aircraft without permission. The police also called the experts to look into the aircraft and they will tell how the aircraft was created and will be used. Police said that Muhammad Fayyaz displayed ‘unsafe antics’ as well that’s why they put the aircraft on a tractor trolley and shifted it to the police station. Muhammad Fayyaz told that he sold his land to make this aircraft and as he tried to fly it, a large number of people gathered around him when somebody from the crowd informed police about the matter. Muhammad Fayyaz is a popcorn seller and a part-time security guard by profession. Talking to Geo News, Fayyaz said that he worked hard in the construction of the aircraft. “I made the aircraft with my hard work. My plane can fly till 1000 feet. Give me one chance so that I can prove that I am a patriotic Pakistani. I informed every department but no one responded me,” said Muhammad Fayyaz. Fayyaz also said that he had sent a request to the CAA to which they never responded. Naseem Ahmed, a CAA expert, told Geo News that the CAA laws are very much clear that Pakistani airspace cannot be used without due permission by any air machine. “There needs to be approved. It’s for their own good for their safety. What if God forbid the plane crashes with any building. Ignorance cannot be used as an excuse,” he added. Although police have released him after he appeared in front of Civil Judge who penalized him of Rs. 3000. Baat To Sach Kahi Hai Apne! It is good to know that youngsters in Pakistan are working on such innovations and showing us the bright side of Pakistan. Muhammad Fayyaz is a common man who tried his best to register his invention but due to the lack of information, it couldn’t happen and he ended up in jail. If he was informed before about the procedure, he would surely do that. However, we hope that the federal government would look into the matter and appreciate Muhammad Fayyaz’s efforts he put in to make an aircraft. Do you want to add more to the story? Share your thoughts with us in the comments! Meet Chaakar And Tabraiz – Two Young DJs From Balochistan Who Are Taking Pakistan’s EDM Scene By Storm! This Teacher In Abbottabad Was Caught Dragging A Little Girl By Her Hair Like A Toy And This Is Absolutely Horrible! PM Imran Khan Considers Removing CM Usman Buzdar And It Seems Like Tabdeeli Scene Is Going Strong! Pakistanis Found This Old Tweet Of Fawad Ch. Saying ‘Mean Things’ About Firdous Ashiq And This Is Karma! 6 Reasons Why Abdul Hafeez Shaikh Is The Perfect Candidate For Finance Minister! Amir Khan Is Peeing Blood After Getting Punched In The ‘Sensitive Area’ By Crawford And All Men Feel His Pain! Copyright 2019 © Parhlo News | All Rights Reserved.